As the seasons change and the weather warms, so too does Hope spring eternal in Rhode Island. Project Hope, that is. That’s the name of the report issued by a consulting firm for Jim Skeffington and his fellow new co-owners of the Pawtucket Red Sox. 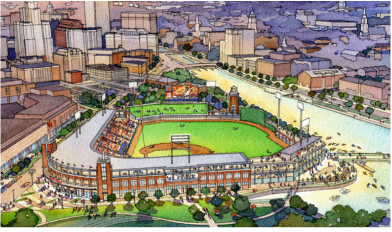 Skeffington and company would like us to imagine the report to be a hard, impartial analysis of the economic benefits of uprooting Pawtucket’s pride to a new riverside baseball park in Providence. The report boasts that the new ballpark would bring millions in indirect benefits to the area as fans crowd hotels and restaurants, and new businesses pop up in the bright glow of a revitalized neighborhood. In reality, these numbers are happy math marketing carefully crafted to “Project” the sensation of “Hope” all over the public. We are meant to gaze into Mr. Skeffington’s crystal ball and see a lovely ballpark, imagine the crack of the bat, the city skyline, and thousands flocking downtown to enjoy. We are also meant to open our collective thin wallet, and open it very wide. Mr. Skeffington is a businessman and attorney, but more accurately, he is a professional dealmaker. He has made a living navigating government and corporate waters and influencing those who control the public purse strings. Some of us build things. Some of us create art. Some of us teach. Skeffington makes deals, and deal-making in Rhode Island has been very good to him. He and his colleagues have the project and they want state and city officials to like it, so happy math and gauzy renderings are to be expected to win over those government goodies. After all, we’re told that tax stabilization agreements are a ‘necessity’ for large projects in cities around the country. On top of that, there is 195 land to be doled out, and those responsible for doling it are probably a little worried at their lack of success thus far. So we could also reasonably expect that Skeffington and Co. see a ripe opportunity and would try to get free land from the 195 redevelopment. With that knowledge, we waited through the late winter, wondering. While we shoveled, plowed, and blew snow into ever growing piles, Skeffington and Co. huddled and drafted a proposal. “What can we get,” they asked themselves? The finishing touches came with the crocuses. Even more maddening is the fact that Skeffington and Co. purposefully fan the flames of fear. He’s made sure to let us all know that he’s received inquiries from “four cities” out of state that are interested. Their implication and our inference are one and the same here; they will rip our team right out of Rhode Island if we reject his proposal. As a Providence resident, I hope — and we should all be hoping — that our elected leaders have the fortitude to stand up to this economic and emotional extortion. Tell Skeffington and his colleagues that we the public are walking away from the bargaining table, Worcester Red Sox be damned. Tell them that we won’t just tweak the deal a little for show and proclaim victory. Tell them that we won’t melt and acquiesce to another crippling financial commitment on the taxpayers behalf. Tell them that we reject the happy math and have had enough of crony capitalism. If your proposal is to take our dollars and give none back, Mr. Skeffington, we’ll keep our little riverside public park, thank you very much. I know I’m far from alone. Social media has exploded over this, galvanizing and uniting Rhode Islanders of all stripes in a way I haven’t seen before. If this project is to continue, we should demand that it provide a concrete revenue stream for city and state taxpayers in return for any public dollars invested — not just warm and fuzzy predictions. This is baseball we’re talking about, after all, so let’s tell our officials to play hardball with Skeffington and Co. Then maybe a fair development deal — one much more tolerable to the public — could be reached. If so, we might even be able to call it Project Hope with a straight face. For the last five years Dave has been a reporter and writer for ecoRI News and state house correspondent for RI Future. In his role as reporter, Dave have been given the opportunity to foster relationships with many of our elected and appointed officials. A native Rhode Islander, Russell J. Moore is a graduate of Providence College and St. Raphael Academy. He worked as a news reporter for 7 years (2004-2010), 5 of which with The Warwick Beacon, focusing on government. He continues to keep a close eye on the inner workings of Rhode Islands state and local governments.